Skydiving is a fantastic sport: you get to leap out of airplanes for pure fun, face your fears, soar high above the ground and enjoy the view that not so many people get to enjoy. Plus, it’s a great community to be a part of: a mix of fun-loving, adventurous, free-spirited, and inspiring people from all sorts of different backgrounds that are united by this unique sport. Skydiving is really all that, and more. The community vibe is very strong, the spirit of adventure pushes you to live an interesting life, and there is so much to explore between all the different disciplines and destinations. Like all of us at some point, you’re itching to get started, but you’re not quite sure where to go for your skydiving training! There are so many schools, different training methods, levels, instructors, prices, and so many factors to consider. We’ll try to lay it out as simply as we can to help you make informed decisions. First, pick a good skydiving school. While “cheap” and “near me” will always be a factor, keep in mind that there’s nothing more important than safety. Pick a professional skydiving school with a good reputation that has been in business for a while and has good reviews online. Larger skydiving centers tend to have more instructors available, a better selection of rental gear, and a fleet of multiple airplanes that allow shorter waiting times. (How do you know which school is larger? Number of airplanes and reviews will be a good indicator.) If you have a deadline in mind for your skydiving training, pick a school that is open 7 days a week. Being a student, you will only be allowed to jump in picture perfect weather, so being flexible on weekdays will let you progress faster. Second, pick a training method. The most advanced training program available now is called AFF (Accelerated Freefall, not to confuse with Adult Friend Finder.. 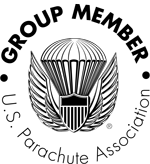 But hey, it may work that way too), which is developed by United States Parachute Association (USPA). At Skydive Cross Keys, we use a streamlined version of the AFF program that we call AFP (Advanced Freefall Progression), that still accomplishes all requirements set forth by USPA, and also offers students an easier introduction into the sport. (We also offer the classic AFF upon request, and we will explain the difference at the end of this post). Your first step will be a tandem skydive. A tandem is the easiest and smoothest introduction to skydiving, where an instructor wears the parachute, and the student’s harness is attached to the instructor’s harness. Think of it as a low stress learning environment: you can focus on learning while the instructor has got your back, quite literally too. You will have to complete 3 tandem skydives, and no, it's not the same jump repeated three times. Each tandem jump will have a separate training session and jump goals you will have to complete to train new skills. Between your second and third tandem jumps, you will be taking a 6-hour classroom training. No napping at this one. This course will teach you everything you need to know to open, fly and land your own parachute safely. Important stuff, so pay attention. After the three tandems and ground training, it will be time to put your own gear on! The drop zone will provide the rentals. An instructor will be by your side at all times, holding on to you in freefall for stability and training, and also because he's scared to jump alone. (That last part was a joke of course, skydiving instructors know no fear!) Each jump with the instructor will be thoroughly briefed, and debriefed upon landing. You will need to make 7-8 jumps (levels) with an instructor. Some students end up doing more, depending on individual progress. A quick note on progress: don’t let weeks go by between your jumps. The more often you jump, the more knowledge and muscle memory you retain, and the better your learning curve will be. USPA requires that training jumps are no more than 30 days apart, but it’s a good idea to jump as often as you can. After you complete the 8 levels, you will officially graduate from the AFP program. That is an achievement worth celebrating, which is coincidentally our favorite thing to do! Bring on the ____________! (insert your favorite celebratory item). Next, you will be cleared for solo jumps. Yay for having the sky all to yourself! But you're still a student, and you will need to practice some more, until you accumulate a total of 25 skydives (tandems count too). Some of your solo skydives will have to be accompanied by a coach to teach you some more skills that would qualify you for your first “A” license. In between those jumps, you will need to take a 3-hour parachute packing class, that is taught by professional nylon compression specialists at our drop zone. (They’re called “packers” in reality, that was just a joke). As you get close to the coveted number of 25 jumps, you will take a written test and make a check out dive with an instructor, who will evaluate your progress and sign you off for your “A” license! We will make sure to celebrate that properly as well, because you know, we’re always happy to celebrate!